For a change I only used my Jack Lalanne Power Juicer to squeeze the juice for my Sunday Smoothie and Vitamin bomb. Carrots; rich in vitamins A, B and C; iron; calcium; potassium and sodium. Carrots have a cleansing effect on the liver and digestive system, help to prevent kidney stones and relieve arthritis and gout. Watermelon; contain vitamins A and C; iron and potassium. Their high water content make watermelons great for summer refreshments. Use a watermelon to bring more liquid into your smoothie. Watermelon blends well with other fruits to make your smoothie a sweet thirst quencher. Grapes; contain large amounts of ellagic and caffeic acids, which deactivate carcinogens, and are a good source of potassium. The flavonoids in grape juice protect the heart, and the resveratrol found in red wine and red grape juice has a protective effect on the cardiovascular system. Grapes also contain boron, which helps estrogen levels, which prevents calcium loss, and may be important in preventing osteoporosis. From left to right: Apple Juice, Watermelon Juice, Carrot Juice, Grape Juice. 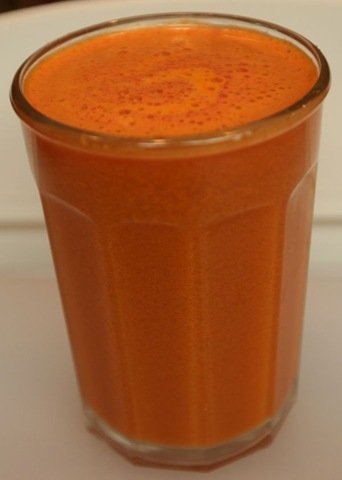 Mixed together, the juice is sweet, but at the same time really healthy. Although my version, as displayed below, was very carrot heavy, you can off course mix your own version yourself. Just remember, the carrot taste is pretty dominant, so you might want to be easy on the carrots at first.